Yes, I am a full fledged stalker. I stalked this J.Crew Factory blazer for weeks. I looked at it online daily hoping it had gone on sales each time I clicked on the website. I could not bring myself to pay full price for it. I stalked and stalked, until it came home with me. During the their 50% off everything sale a couple of weeks ago, they had one left. It was my size and on super sale. Sometimes being a stalker pays off. I also stalked these Lay's chips. I hit at least five stores trying to get my hands on a bag. Once I found them, you bet your boots that I grabbed four bags. You can also bet that I voted on their Facebook page to keep these bad boys around. The most addicting chips I have ever put into my mouth. Another stalking tendency of mine is religiously checking out the girls from @targetdoesitagain on Instagram. I have mentioned them before and I can't get enough of their posts. I have rushed out to Target on numerous occasions to grab an item that they posted. Example, the bag I am carrying in today's post. I will admit that I have had my fair share of creeping on Facebook, Twitter, Instagram and blogs in general. I won't comment, leave a message, like the picture or let them know I have been "there". It's all harmless, I promise. Maybe using the word "creeping" isn't the best term...let's just call it being curious. Are you a stalker, creeper or curious kitty? If so, what's on your list? One thing I bet you will be adding is a girl I am about to introduce you to. I will openly admit that I stalk her blog, her style and how incredibly gorgeous she is. I have told her several times that she should seek a career in modeling. She is that beautiful. Everyone say hello to Serena with The Serena Saga. Serena is one of my favorite fashion bloggers. Her style is off the charts, unconventional (in a good way) and full of grace and edge. She already has a couple of press features under her stylish belt and it has been such a pleasure to watch her blog grow. Mark my words, Serena is going places and I wouldn't be surprised in the slightest if we see her picture on the cover of a magazine one day. There is just something about her that will draw you in time after time. I am not sure if it's her daring style, flawless beauty or down to earth personality. Most likely, it's a culmination of all three and then some. If you need a daily fashion fix, The Serena Saga is one to add to your list of reads. She will surprise you everyday with her stellar looks and fashion forward style. I can guarantee you that. Today, Serena has been so gracious to offer one Because Shanna Said So friend a $25 Visa gift card. Be sure to block out some time because once you visit Serena, you are going to want to read and see more than just her latest post. Honestly, don't think that I am STALKING you, hahahaha, but, I just so happen to be at my comp when you first post up. Cool, in my opinion. I love this dress! I love the pink blazer! (did you know I can't wear blazers? they sit odd on the back of my neck and drive me nutz!) and ...I already know Serena! She is marvelous! I am not a stalker, I'm not, honest! hahahaha. Um i stalk you!! duh!! ;) Love the Wallis dress and I have been thinking about the other, form fitting version for my grad/ wedding dress. Ha! I just wrote a post about stalking! But it's about Facebook stalking. We tried all three new Lays flavors and I liked the Sriracha but I'm a huge Sriracha fan so that was a given that I'd like that. I love Sriracha but have never seen these chips. Now I must find them!! I love Serena. She always has such great style! Seems like stalking pays off sometimes! Don't you love it when that happens with great pieces? I'll have to check out Serena's blog now too - looks like she and I share a closet by the looks of those pictures! I would have totally stalked that blazer, too. It is fantastic! I need to look them up on Instagram! What you do with the Target girls on instagram...I do with your blog! Haha. I have totally gone out and bought something just because you looked so cute in it. :) And I'm so curious to try those chips now!!! I prettty much stalk all of the above things listed. Clearance racks, I have a thing for the Honey Mustard Ruffle Chips, and I LOOOOOOVE @targetdoesitagain girls. I am gonna move to Texas so we can be best friends/twins. YAY! LOVE the blazer! Stalking TOTALLY paid off! How cute are you?! I absolutely love this blazer & floral dress combo! So feminine & spring-like! And so awesome that your stalking paid off! I have been wanting to try those chips but don't even know if they're available in Canada! I haven't seen them anywhere yet, but as a hot sauce lover, they sound SO good! xo! 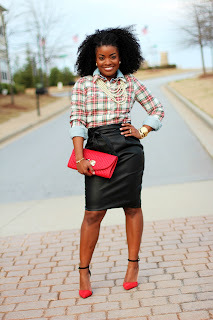 i think we know i stalk your blog... just love it and this gorgeous look!! Yeah, I would definitely say that stalking paid off in this case!! You look fabulous - like you are ready for the Kentucky Derby! That pretty pink blazer was def work the stalking! I stalk the @targetdoesitagain too but I'm in Target so much that a lot of times I've already seen the item, haha. You look so gorgeous my friend. What a pretty dress and I love the blazer. Good job with the stalking, haha. And I've never even heard of that flavor of Lays! I love your outfit it's feminine and pretty. The blazer is perfect, the stalking definitely paid off! I love this dress on its own, but it's even cuter with the matching blazer! She is so cute! I'll have to check out her blog. You look so cute in that floral dress. The blazer stalking paid off. Love this look! Shanna -- I don't know if its the location, your rockin outfit, or your fabulous blonde hair, BUT this is one of my fav posts of all time. I'm off to find those chips!!! How do I not follow that account on Instagram!! Haha. I am a notorious store stalker. I never pay full price for any thing, but it usually takes me a few weeks just to buy one item. I've been stalking that Wallis dress for weeks! LOVE this outfit Shanna! Absolutely perfect, in every way. I totally feel like I am stalking people sometimes!! but it's not the bad kind...it's the good kind so it's okay. Your persistence paid off with that blazer. My favorite color! Love Serena's bubble skirt. Love that blazer and serena, isn't she the sweetest??? Love this look! I am totally obsessed with J. Crew Factory too.. I dieee over their 50% off sales!! oh girl you know I am a stalker too. In almost anything, its just so fun!! & I love Serena's style, I will be going over to pay her a visit!! I wish I had more time for stalking :) Sometimes I will start and then get so busy...stalking of said item or person is forgotten. Love that necklace!! Loving your hair in these pictures love! I'm getting my hair cut later this week and debating if I want to keep it long, sleek and blonde or go ombre and shorter (or vice versa)... but I'm so loving your long perfect blond locks today. What to do, what to do. That is such a pretty dress! And that pink blazer is amazing! I'm so sad there isn't a J.Crew Factory near me or I would have bought everything at the 50% off sale! Gorgeous dress, love the outfit!! I am pretty loyal to kettle chips but these are tempting. i love your outfit! i stalk clothes online all the time too - it's worth it if i can get it at an amazing price! hmm what else do i stalk? i guess i stalk some blogs without even realizing it! Serena really is gorgeous - that hair is stunning! i want that dress soo badly! it's adorable!! MFD would love those chips. I'll have to keep my eyes peeled. Your blazer stalking was totally worth it! Looks great! I definitely stalk the @Targetdoesitagain girls. I have bought several things from their pictures. And I definitely have blogs or instagram pages that I do that with. Thanks for the link to @targetdoesitagain!! I hadn't heard of them and am definitely stalking them now, ha! You look amazing and I love your dress! Love yoru outfit and the blazer is gorgeous. Good job on the stalking. IT pays off to be patient. WOW! So beautiful! I love that you admit to being a stalker and creeper. It's one of my specialties and I'm not afraid to admit it. I love the black accessories in your outfit and I also love the Serena Saga! Wow! She is gorgeous. I wouldn't be surprised if I saw her on a cover of a magazine one day either. I love her blog-- thanks for introducing me to her! You look great as always-- and give me a good laugh after a day of work! Shut UP I LOVE this outfit! My new fav. That dress is so amazing!! And your hair - perfect. Do you tease it? Teach me your ways! Those Lays cannot be found ANYWHERE in my town! BOOOOO! I am a stalker!! I'm still stalking a sweater on ASOS that I've had my eye on for months. Hoping patience pays off! I also think those chips were TOTALLY worth stalking! 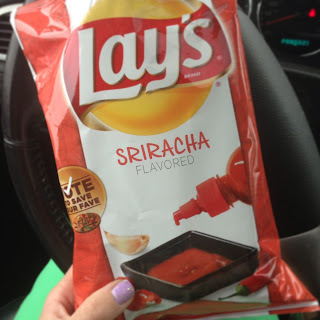 I haven't tried the other flavors, but they seriously need to make the sriracha ones in big bags!! I see that stalking pays off sometimes. :-) I love your pink blazer. I just recently found one while thrifting. Pink is a nice color. Love the blazer too! Amazing find! And 50% off, holla!! LOVE that dress on you Shanna!! And paired with that bright pink blazer is just TOO cute!! Since I follow you on multiple media - I am probably stalking you :) Thanks for introducing me to @targetdoesitagain - this may be dangerous. This dress is perfect on you! Yeah I'm kind of a stalker sometimes. You're not alone there! Every time you post an outfit I want every piece! I can't believe that I missed a 50% off J.Crew sale! Ugh! I'm a huge fan of dresses so I'd go with the Camille, Evi or Lesli! So many fabulously cute options! I love your dress too...those pink flats are gorgeous! Shanna, that dress is so beautiful on you! Oh I am a major stalker.. recently I've been stalking all kinds of fit bloggers trying to find ways to make myself like them ;) and I always stalk you and your adorable outfits. This one I love so much! Fabulous outfit! This would be great for Mother's Day! 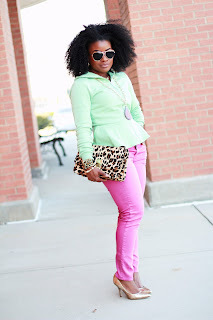 I hope you dont mind but i am using this for my fashion favorite friday link up post tmrw!! you look so pretty and feminine!! I can't decide what I like most: your hair, the blazer, dress, or the XO necklace? I will take one of each please (well with the exception of your hair. You can keep that hehe) I have been searching everywhere for the sriacha chips!! I want to surprise my hubby with them! I know that I would love those chips, because I even put sriracha on plain chips at home!